Tennessee considers reducing chronic absence essential to its goals of improving educational outcomes across the state. An analysis of the state’s own attendance data shows that absenteeism correlates with lower test scores and higher dropout rates. 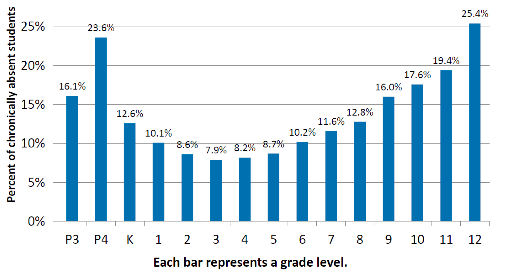 The analysis also shows chronic absence rates are highest in the early grades and again in high school, and that absenteeism disproportionately affects some student populations. The Tennessee Department of Education reduce chronic absence as it works to improve 4th grade reading levels, increase average scores on the ACT and ensure that every high school graduate has access to community college. Tennessee students missed an average of eight days in the school year, with the highest numbers of days missed in pre-kindergarten and 12th grade. With an average daily attendance rate just above 95 percent, Tennessee nonetheless has 13.1 percent of its students missing 18 or more days, the state’s definition for chronic absence. Economically disadvantaged students are chronically absent at a rate two and a half times higher than other students. Black students and students with disabilities also have disproportionately high rates of chronic absence. About half of chronically absent students in the 3rd and 9th grades have been chronically absent for several years in a row. Students missing two or more days in August are five times as likely as their peers to be chronically absent. On an average school day, about 5,000 Tennessee students are absent from their classroom due to a disciplinary action. These disciplinary-related absences disproportionately affect low-income and black students. A third of students who are chronically absent in 9th grade don’t graduate on time, compared to 10 percent of those with better attendance. Students are less likely to score a 21 or higher on the ACT if they are chronically absent and less likely to score proficient on the state’s math test. Tennessee made chronic absence the focus of its September 2015 Conditions for Learning Forum. Attendance Works Director Hedy Chang delivered the keynote address at the event, which drew district leaders and educators working with special populations, health, safety, nutrition, extended learning, early childhood and other student and family support areas.